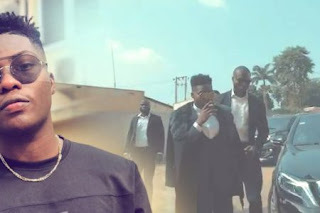 Reekado Banks‘ Banks Music was unveiled with a video on Sunday, the 9th of December where the singer posted on social media announcing himself and his team in grand style. Can’t see video? Click to like and watch on our Facebook page Be the first to get viral videos. Reekado Banks announced his exit from Mavin on the Friday, 7th of December and his exit got reactions that were all positive as fans and social media commentators hailed him for leaving the label the right way, a statement which is in comparison to how other artistes have left their labels in the past. Even the former label, Mavin Records congratulated him and expressed their good wishes towards his new journey.